The North Bay Battalion would claw their way back on Sunday afternoon and win 3-2 in overtime, thanks to Adam McMasters wrap around attempt found its way past David Ovsjannikov. Barrie came into this game having played on both Friday and Saturday night. This was their third game in two and a half days; the boys were going to have to be on the top of their game to pick up a victory in this one. Most of the first half of the opening frame was a back and forth affair with no real chances being created by either team. That was until the seven-minute mark, when Barrie’s overage forward Roy Radke was sprung in all-alone on Brent Moran but couldn’t finish it off, keeping the game scoreless. 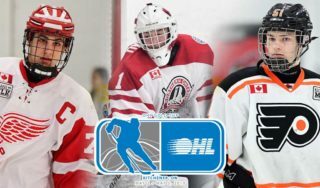 There was very little to no excitement in the period aside from two of the biggest players in the OHL as Curtis Douglas who stands six foot eight and North Bay Captain Riley Bruce who is six foot seven squared off before the buzzer would sound, giving the fans something to cheer about. It didn’t take long to get some excitement in the second through. Aidan Brown crashed the net to bang home a rebound for his 3rd goal of the season. It all started with Jaden Peca,(who drew an assist) making a play along the wing followed by throwing it on net, where Brown was waiting to knock it home to give the Colts a 1-0 lead. The rebound was originally stopped but while the puck was bouncing around Moran’s stick knocked it into his own net. The fun would continue with Lucas Chiodo’s 16th marker of the year. Zach Magwood would find the puck in the corner and while taking a hard check he made the pass out front to Chiodo who outwaited Moran to create an opening and slid it home, giving the boys a 2-0 lead. The Battalion wouldn’t let that goal keep them down. Jacob Ball would net his 4th of the year as he found a bouncing puck in the slot before burying it over the glove hand of Ovsjannikov who got the nod after coming into the game for relief a night ago. With less than four minutes to go in the period, Chiodo was looking to extend the lead to two again as he picked off a pass and went in on a break. He would make a deke but Moran was able to stay with him, keeping it out. The play wasn’t done there though as the Gilford, ON native threw it out front to Ben Hawerchuk who also couldn’t beat the Battalion net-minder, keeping this game close. Barrie was looking to avoid giving up a two goal lead for the second straight night, but early in the third it happened again. After a puck was shot from the blueline Ovsjannikov lost the puck and was scrambling while trying to look for it, who found it was Steve Harland who had a wide open net for his 20th of the season tying the game. That goal was the lone goal in the third, sending this one to overtime. Early in overtime North Bay was looking to end it but Ovsjannikov came across and made a huge stop keeping it tied. A couple minutes later Peca had a chance on a two on one but his backhander was kept out by Moran before McMaster minutes later would win it for North Bay. Barrie is next in action on Thursday night as they are back home playing host to the Saginaw Spirit. Puck drops at 7:30pm. 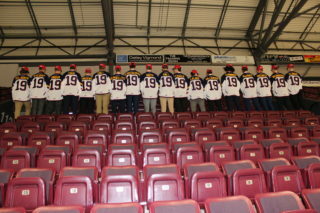 Tickets available at www.barriecolts.com.